Switzerland is affected by climate change in various respects, from more frequent landslides with less permafrost in the mountains, to extreme climatic events like hot and dry summers or heavy rainfall and storms. In 2015, Switzerland declared their intention to halve their greenhouse gas (GHG) emissions by 2030. 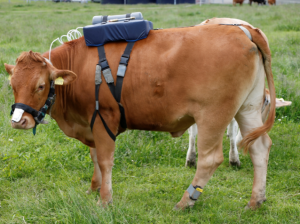 Due to a large population of cattle as the dominant livestock category in Switzerland, the contribution of livestock-derived emissions is comparably high. Switzerland has signed the Kyoto protocol and has implemented a strict environmental policy for several decades. Livestock agriculture, economically the most important agricultural sector, is under scrutiny for its various environmental impacts. The focus is now on 1) maximum livestock densities per hectare, 2) closed farm nutrient balances, and 3) technologies for mitigating ammonia emissions. No special treatment of the problem of GHG emissions has been implemented so far; however in 2011 the “Climate Strategy Agriculture” was put up and a number of elements of this strategy will be implemented gradually. Switzerland sees the Global Research Alliance on Agricultural Greenhouse Gases (GRA) as one helpful instrument to be able to meet its ambitious mitigation goals because it expects to learn from the successful approaches of other countries and profit from mutual experience. It also offers to share its experiences with other countries having a similar landscape (mountainous) and climate. In addition, Switzerland expects and has experienced progress in research on GHG mitigation by multinational projects facilitated by the GRA. The Swiss Federal Office for Agriculture (FOAG) represents Switzerland in the GRA. Together with The Netherlands, Switzerland founded the very active Feed and Nutrition Network of the Livestock Research Group. It hosted the first meeting of this network from 1 to 3 September 2012, with participants from 14 countries attending. Switzerland is also participating in the “Global Network” funded by FACCE JPI, which was the result of this network. Switzerland will also feed data from its long-term field experiments into the project MAGGnet, a consortium of countries aiming at identifying cropland management practices that reduce GHG emissions (part of FACCE JPI). In addition, Switzerland participates in the FACCE-JPI project Models4Pastures, assessing the effectiveness of technologies and management regimes to reduce N2O emissions from grazed pastures, as well as in the project Delivering Food Security on Limited Land (DEVIL), addressing feedbacks and interactions between land use change and food security dynamics. These projects benefit from the long-term measurements of biospheric-atmospheric trace gas exchange (CO2, H2Ov, CH4, N2O) within the Swiss FluxNet, covering all three different land-use types in Switzerland: forest, grassland and arable land.